This 60 minute guided tour takes you through the history of letterpress printing. Immerse yourself in the process of how posters were printed in the 1800's. At the end of your experience, take your commemorative poster home to show your family and friends. Redeem voucher at Country Music Hall of Fame and Museum. Actual tour times will be assigned at the time of redemption. Please arrive before 11am for greatest tour availability. Founded by brothers Charles and Herbert Hatch, this iconic shop opened in Nashville in 1879. For much of the twentieth century, the shop's vibrant posters served as a leading advertising medium for Southern entertainment and included work for many members of the Grand Ole Opry including Bill Monroe, Minnie Pearl, and Ernest Tubb as well as Rock & Roll icons such as Elvis and Chuck Berry. Thousands of posters and billboard-size advertisements were also printed for the traveling vaudeville and minstrel shows, circuses, and carnivals barnstorming across the country. In 1992, Hatch Show Print became a historic property under the Country Music Hall of Fame and Museum. 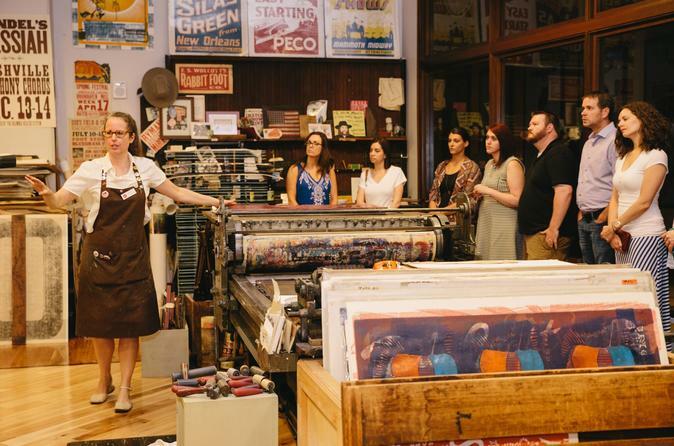 On a 1 hour guided experience, learn more about this iconic letterpress poster shop. The tour of legendary Hatch Show Print will engage your senses: listen to the presses crank as you learn about the history of Hatch Show Print, see the brilliantly colored posters that put the shop on the map in the last century and compare them with the posters printed today for your favorite entertainers, handle some of the tools of the trade and smell the ink as you pull your own keepsake print in the print shop-within-a-print shop Space for Design. Special Offer - Book and travel by April 30 and save X% off our previously offered price! - Book Now!